Weimar Republic (German: Weimarer Republik [ˈvaɪmaʁɐ ʁepuˈbliːk]) is an unofficial historical designation for the German state between 1919 and 1933. The name derives from the city of Weimar, where its constitutional assembly first took place. 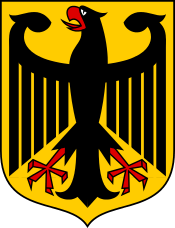 The official name of the state was still Deutsches Reich; it remained unchanged since 1871. In English the country was usually known simply as Germany. The republic was a semi-presidential representative democracy, which emerged in the aftermath of the German Revolution of 1918–19. A national assembly was convened in Weimar, where a new constitution for the Deutsches Reich was written, and adopted on 11 August 1919. In its fourteen years, the Weimar Republic faced numerous problems, including hyperinflation, political extremism (with paramilitaries – both left- and right-wing); and contentious relationships with the victors of the First World War. The people of Germany blamed the Weimar Republic rather than their wartime leaders for the country's defeat and for the humiliating terms of the Treaty of Versailles. 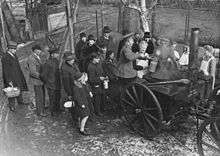 However, the Weimar Republic government successfully reformed the currency, unified tax policies, and organized the railway system. Weimar Germany eliminated most of the requirements of the Treaty of Versailles; it never completely met its disarmament requirements, and eventually paid only a small portion of the war reparations (by twice restructuring its debt through the Dawes Plan and the Young Plan). 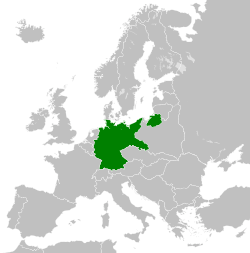 Under the Locarno Treaties, Germany accepted the western borders of the republic, but continued to dispute the Eastern border. 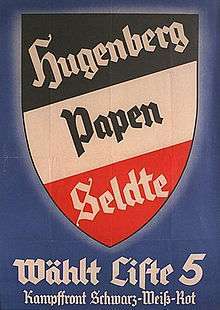 From 1930 onwards President Hindenburg used emergency powers to back Chancellors Heinrich Brüning, Franz von Papen and General Kurt von Schleicher. The Great Depression, exacerbated by Brüning's policy of deflation, led to a surge in unemployment. In 1933, Hindenburg appointed Adolf Hitler as Chancellor with the Nazi Party being part of a coalition government. The Nazis held two out of the remaining ten cabinet seats. Von Papen as Vice Chancellor was intended to be the "éminence grise" who would keep Hitler under control, using his close personal connection to Hindenburg. Within months the Reichstag Fire Decree and the Enabling Act of 1933 had brought about a state of emergency: it wiped out constitutional governance and civil liberties. Hitler's seizure of power (Machtergreifung) was permissive of government by decree without legislative participation. These events brought the republic to an end: as democracy collapsed, a single-party state founded Nazi era. Even so, German Foreign Office official Harry Graf Kessler had predicted as early as February 1919 that the Republic was doomed. "The paradox", he wrote, "by which a Social Democratic Government allows itself and the capitalist cash-boxes to be defended by royalist officers and unemployed on the dole is altogether too crazy." 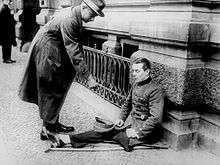 His friend and socialist liberal German Democratic Party colleague Walther Rathenau was assassinated, just like Matthias Erzberger before him, by right-wing assassin squads Organisation Consul. Like the Nazis, the Consul was founded by the Freikorps. Opting for a military solution, the Republic in Germany was destroyed by gangsterism, infighting, incompetence, political naivete, and international debt obligations. 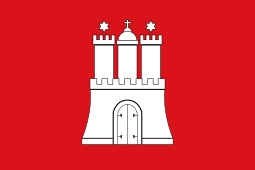 After the introduction of the republic, the flag and coat of arms of Germany were altered to reflect the political changes. 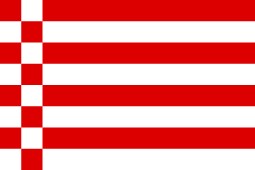 The republican tricolour is based on the flag that the Paulskirche Constitution of 1849 introduced, which was decided upon by the German National Assembly in Frankfurt am Main, at the peak of the German civic movement that demanded parliamentary participation and unification of the German states. Although technically in service of the republic, the army was predominantly officered by conservative reactionaries who were sympathetic to right-wing organisations. Hans von Seeckt, the head of the Reichswehr, declared that the army was not loyal to the democratic republic, and would only defend it if it were in their interests. During the Kapp Putsch for example, the army refused to fire upon the rebels. However, as right wing as the army was, it hesitated to assist the Nazis, whom they mostly viewed as thugs. The SA was the Reichswehr's main opponent throughout its existence, as they saw them as a threat to their existence, and the army fired at them during the Beerhall Putsch. Upon the establishment of the SS, the Reichswehr took a softer look upon the Nazis since the SS seemed more respectable, and openly favoured order over anarchy. In 1935, several years after Hitler came to power, the Reichswehr was renamed the Wehrmacht. 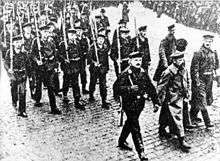 Germany lost the war because the country ran out of allies and its economic resources were running out; support among the population began to crumble in 1916 and by mid-1918 there was support for the war only among the die-hard monarchists and conservatives. The decisive blow came with the entry of the United States into the conflict, which made its vast industrial resources available to the beleaguered Allies. By late summer 1918 the German reserves were exhausted while fresh American troops arrived in France at the rate of 10,000 a day. Retreat and defeat were at hand, and the Army told the Kaiser to abdicate for it could no longer support him. Although in retreat, the German armies were still on French and Belgian territory when the war ended on 11 November. Ludendorf and Hindenburg soon proclaimed that it was the defeatism of the civilian population that had made defeat inevitable. The die-hard nationalists then blamed the civilians for betraying the army and the surrender. This was the "Stab-in-the-back myth" that was unceasingly propagated by the right in the 1920s and ensured that many monarchists and conservatives would refuse to support the government of what they called the "November criminals". To help Germany meet reparation obligations, the Dawes Plan (1924) was created. This was an agreement between American banks and the German government in which the American banks lent money to German banks with German assets as collateral to help it pay reparations. The German railways, the National Bank and many industries were therefore mortgaged as securities for the stable currency and the loans. Shortly after the Locarno Treaties were signed. 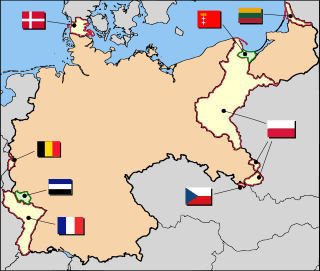 The British, French, and Germans agreed that the borders between their countries would not be changed by force, thus the new borders acted by the Treaty of Versailles were being reinforced by the signing countries, but weakened the 1919 treaty regarding the eastern borders. Germany also agreed to sign arbitration conventions with France and Belgium and arbitration treaties with Poland and Czechoslovakia, undertaking to refer any future disputes to an arbitration tribunal or to the Permanent Court of International Justice. 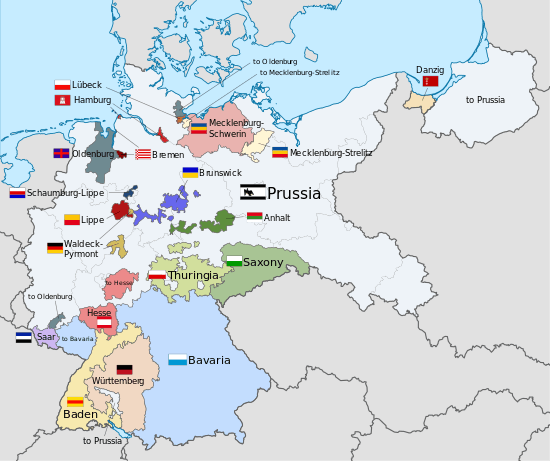 Other foreign achievements were the evacuation of the Ruhr in 1925 and the 1926 Treaty of Berlin, which reinforced the Treaty of Rapallo in 1922 and improved relations between the Soviet Union and Germany. In 1926, Germany was admitted to the League of Nations as a permanent member, improving her international standing and giving her the ability to vote League of Nations legislation. However, this progress was funded by overseas loans, increasing the nation's debts, while overall trade increased and unemployment fell. 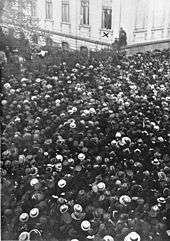 Stresemann's reforms did not relieve the underlying weaknesses of Weimar but gave the appearance of a stable democracy. The major weakness in constitutional terms was the inherent instability of the coalitions. The growing dependence on American finance was to prove dangerous, and Germany was one of the worst hit nations in the Wall Street Crash of 1929. Most historians agree that many industrial leaders identified the Weimar Republic with labour unions and the Social Democrats, who had established the Versailles concessions. Although some saw Hitler as a means to abolish the latter, the Republic was already unstable before any industry leaders were supporting Hitler. Even those who supported Hitler's appointment often did not support all of Nazism and considered Hitler a temporary solution in their efforts to abolish the Republic. Industry support alone cannot explain Hitler's enthusiastic support by large segments of the population, including many workers who had turned away from the left. The political parties started to have a role in creating a government only in October 1918. They had a massive inexperience. ↑ Harry Kessler (1999), Berlin in Lights: The Diaries of Count Harry Kessler, 1918-1937, Grove Press, New York. p.63. ↑ "Weimar Republic". Encyclopedia Britannica. Retrieved 2012-06-29. 1 2 Eva-Maria Schnurr (September 2014). "Der Name des Feindes: Warum heißt der erste deutsche Demokratie eigentlich "Weimarer Republik?"". 5/2014 (Der Spiegel - Geschichte 3 Hausmitteilung 137 Impressum ed.). Der Spiegel: 20. 1 2 3 Sebastian Ullrich as quoted by Eva-Maria Schnurr (September 2014). "Der Name des Feindes: Warum heißt der erste deutsche Demokratie eigentlich "Weimarer Republik?"". 5/2014 (Der Spiegel - Geschichte 3 Hausmitteilung 137 Impressum ed.). Der Spiegel: 20. ↑ "Two Centuries of Solidarity". ↑ "Social Relations in the Estate Villages of Mecklenburg C.1880-1924". ↑ Arthur Rosenberg. "A History of the German Republic by Arthur Rosenberg 1936". ↑ Diest, Wilhelm; Feuchtwanger, E. J. (1996). "The Military Collapse of the German Empire: the Reality Behind the Stab-in-the-Back Myth". War in History. 3 (2): 186–207. doi:10.1177/096834459600300203. ↑ Watson, Alexander (2008). "Stabbed at the Front: After 1918 the Myth Was Created That the German Army Only Lost the War Because It Had Been 'Stabbed in the Back' by Defeatists and Revolutionaries on the Home Front. Reviews the Clear Evidence That in Reality It Simply Lost the Will to Go on Fighting". History Today. 58 (11). ↑ Ian Kershaw (2000). Hitler, 1889-1936: Hubris. W.W. Norton. p. 136. ↑ "Josephine Baker in Berlin". 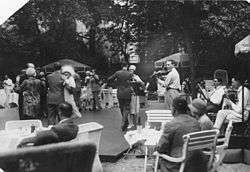 Cabaret Berlin – Exploring the entertainment of the Weimar era. 8 December 2010. Retrieved 11 June 2011. ↑ Delmer, Sefton (1972). Weimar Germany: Democracy on Trial. London: Macdonald. pp. 82–93. ↑ "Full text of "Labour Under Nazi Rule"". ↑ "Decoding Modern Consumer Societies". 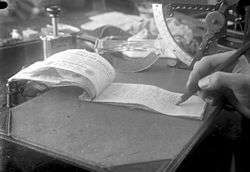 ↑ "Welfare, Modernity, and the Weimar State, 1919-1933". ↑ "The Provision of Public Services in Europe". ↑ "Growth to Limits: Germany, United Kingdom, Ireland, Italy". ↑ Ruth Henig. The Weimar Republic 1919-1933. 1 2 Rosenberg, Arthur (1936). 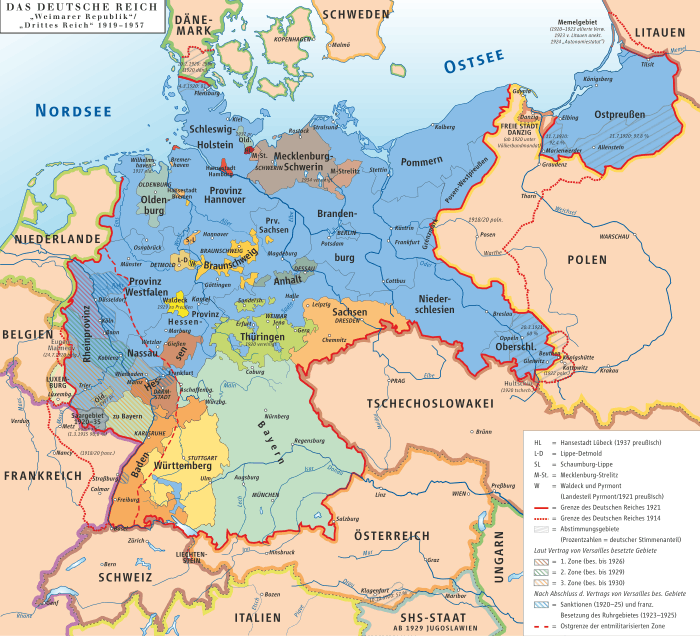 A History of The German Republic. London: Methuen. ↑ Evans, Richard J. (2004). The Coming of the Third Reich. New York: The Penguin Press. p. 446. ISBN 1-59420-004-1. ↑ As Kershaw notes (p. 468 ), after the passage of the Act, "Hitler was still far from wielding absolute power. But vital steps toward consolidating his dictatorship now followed in quick succession." 1 2 Klemperer, Klemens von (1992). German Resistance Against Hitler:The Search for Allies Abroad 1938–1945. Oxford: OUP / Clarendon Press. ISBN 0-19-821940-7. ↑ Mowrer, Edgar Ansel (1970). Triumph and Turmoil. London: Allen & Unwin. p. 209. ISBN 0-04-920026-7. ↑ Shirer, William L. (1960). The Rise and Fall of the Third Reich. New York: Simon & Schuster. ISBN 0-671-72868-7. ↑ Markovits, Inga (March 2008). "Constitution Making After National Catastrophes: Germany in 1949 and 1990" (PDF). William and Mary Law Review. 4 (4): 1317–1318, 1320. Retrieved 13 May 2012. ↑ "Article 140 [Law of religious denominations]" (PDF). Basic Law for the Federal Republic of Germany. Trans. by Christian Tomuschat and David P. Currie; trans. revised by Christian Tomuschat and Donald P. Kommers. Berlin: Public Relations Division, German Bundestag. October 2010. Retrieved 13 May 2012. ↑ Primoratz, Igor (2008-05-08). Patriotism: Philosophical and Political Perspectives. Routledge. p. 98. ISBN 978-0754671220. Smith, Helmut Walser, ed. (2011). "18-25". The Oxford Handbook of Modern German History. pp. 862 pp.